Notre Dame receiver Chris Finke has always had the attention of the coaching staff, media and his teammates as he stood out from the first day of fall camp as a freshman. The 5-foot-10, 182-pounder has come a long way from being a walk-on and is now in a leadership position on a team looking to make back-to-back appearances in the College Football Playoff. The Ohio native has never been the most vocal guy in the world, but he has the respect of his teammates when he speaks. Notre Dame receivers coach Del Alexander will lean on Finke to not only lead a young receiver room, but also to teach the young group how to practice and conduct themselves on a daily basis. There’s a lot of raw talent in the room and Finke has seen them go about their business in the right way to this point. In 2018, Finke officially arrived in the blue and gold as he caught 49 passes for 571 yards and two touchdowns. Quarterback Ian Book returns as the starting quarterback and Finke has noticed some small changes in the California native. The changes in Book’s game aren’t just noticeable in the locker room, but also on the practice field. “He’s super confident and knows where the throws will be and what the overages are going to be,” Finke said. “He can put it on the spot because he’s a talented quarterback. 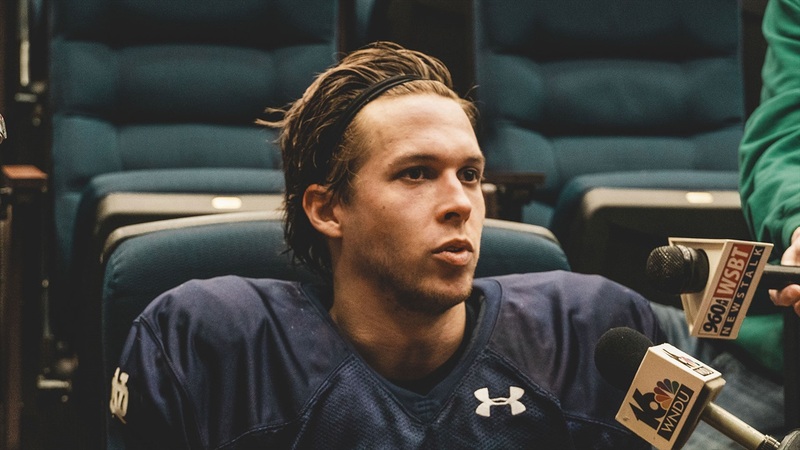 Finke will look to provide Book with a consistent receiver this fall from the slot and once it’s over, he’ll have time to reflect on just how far he’s come in four years.